Love my headboard. My bedroom is totally redecorated from O products. Everything is perfect. This headboard came in well packaged. The grey is as pictured. We had issues lining up the holes but it was the bed, not the headboard. It is so sophisticated! My bedroom is gorgeous. 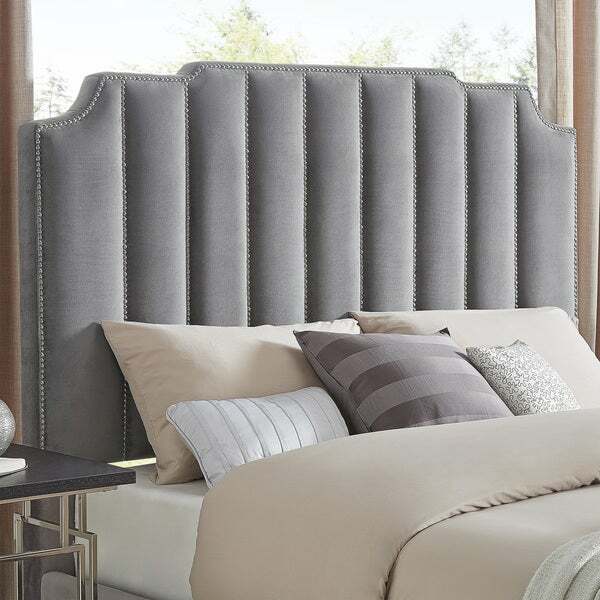 Give your bedroom or guestroom a striking, luxurious transformation with the art deco inspired Chareau velvet upholstered headboard fromiNSPIRE Q® Bold. The elegant design and eye-catching details, like nail head trim, create an air of grandeur that will complement any modern, contemporary, or glam design. Loving this new headboard but didn't give it a 5 because it has a slight defect. There's a hole near the nailhead seam. Other than that the color is more like an off white, not beige. And it looks great with my new textured wallpaper. I would recommend it. Nice and sophisticated headboard. Nice fabric with silver tack finishing. The headboard is tall enough to give the bed height without hanging art above. They tricked by showing full bed picture. I received the box and it was only head board. I called and over stock said I have to pay *** Shipping to order rails and foot board. *** just for head board is just rip off!! This is a gorgeous headboard. I purchased the black one. I wish i had ordered the entire bed, with sides and footboard, and I am considering trying to order the rest of it. So if you are in between, go for the whole bed, you'll be glad you did. The material is very nice. I do think the nail heads look shinier and more obvious in person. I wasn't sure how i felt about that, but I am used to it now. I wanted a tall headboard and this fits the bill. I will say that the metal frame that i had didn't attach to the headboard, but a newer one does. Overall im very happy with my purchase and i feel its a great value. I also think any of the other colors would be beautiful. I wish i could have them all! Oh, also, i was able to put this together myself. It is large, but it was simple and i had it out and set up fairly quickly. This headboard is even more gorgeous in person. I am so excited! Can't wait to put it together and get my new bed all fancied up! if you like the trend in reviving art deco up to Hollywood regency, this headboard is for you. 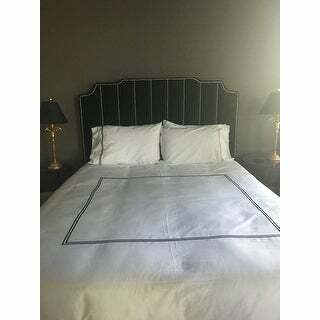 I also order the enter bed for my guest room and it does look smashing. 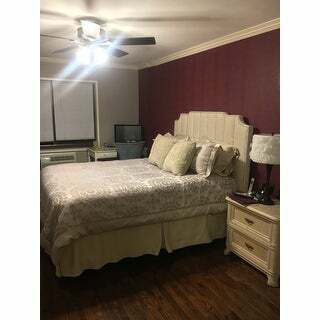 The bedframe does not use high quality materials, but is sturdy enough that I had been using for six months while my house was repaired from Hurricane Harvey flooding. It has an elegant look at a reasonable price. You can thousands more for similar beds without much, if any, improvement in style. Very pleased with my purchase. This headboard is really pretty and exactly what I expected. It added a ton of personality and Glam to my daughter’s room. I would definitely recommend it. It was a great buy for the price ( I got it on sale on Black Friday for around $ for the full size in Gray)the only reason I didn’t give it 5 stars is the holes didn’t match up to attach it to her bed frame, so we had to drill our own holes in the frame to attach it. I absolutely adore this bed, the material is plush and soft. I got the cream color, I was worried it would be too light, but its perfect. It fits my box spring and mattress. I didn't give it 5 stars because I think the frame could use some more support. I may add a few wood 2x4 to the frame just to make it a bit sturdier, but that is an easy fix. I ordered the dark grey. It is beautiful! Initially I didn't see the legs of the headboard and discovered they were hidden in the back of the headboard. I almost returned it because when I contacted overstock I was told legs weren't included. They said it would be an additional cost. I'm glad I didn't let my frustration get the best of me. I love my headboard! The nails are not individual but a chain. On delivery one section had started to peel off, however, this was fixable. Overall seems like good quality. Easy to put together, I did it alone. There is a place the board can attach to the frame, however, we felt it wasn't necessary. Nice and tall, so it's a nice presence and doesn't get lost behind pillows. Purchased this gorgeous headboard in black. It is perfect, exactly as described,and if possible more beautiful in person. Highly recommend! 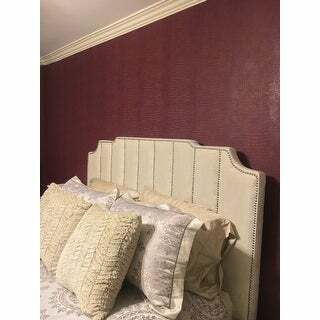 This headboard looks so glamorous in my guest bedroom it was the exact touch I was wanting and looks expensive but was a great deal. It was easy to assemble. And it’s nice and tall so it is a focal point when you walk in the room. It was the perfect touch to finish off my room!!!! It looks good from afar, but is cheaply made with staples. The upholstery tacks are really just a ribbon of metal circles. Seems to fit but sits just a smidge above the floor. Hope that’s OK. I’m afraid if I move, it wouldn’t fare very well. OMG! LOVE THIS HEADBOARD!!! So soft. So elegant! So well-made! I did not get the opportunity to enjoy product. I had to return it because I did not know I needed to the rails for it. Disappointed. "There is a charcoal grey AND a light grey shown. Is the charcoal grey available in King?" The color closely resembling charcoal is the black option which is out of stock as of today. 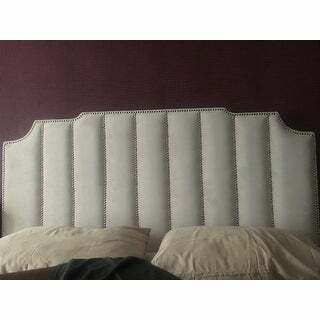 "wil this headboard be restocked in king / cream or king/ grey ?" The beige color has been discontinued and it is not expected to be restocked. The grey is expected to be back in stock in late May. "will this be restocked in King / Cream or King/ grey ??" The beige option has been discontinued and it is not expected to be restocked. The grey color is expected to be back in stock in late May. It’s a really nice looking bed and the price was good! "Will this gorgeous headboard ever be available in KIng/Black???" "Will the beige velvet complete queen size bed be restocked any time soon?" "I just purchased this headboard. Can you tell me what the fiber content of the velvet is? It will make a difference for whether it can be dyed." We do not recommend altering this product as it will void the warranty.